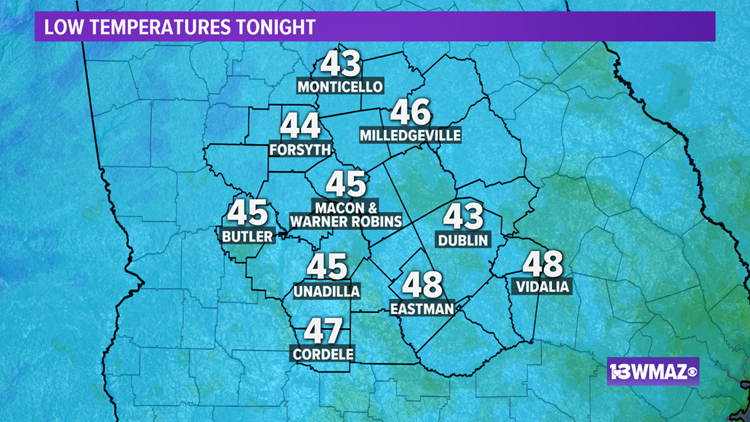 Cool again tonight. Warmer for Easter! The cool weather that we've seen today will continue overnight, but warmer temperatures return Sunday and continue this week. Clouds we're stubborn to break across Central Georgia today, but that will finally change overnight. An upper level low will move northeast and take any remaining moisture with it. We'll wake up on Easter Sunday under mostly sunny skies. Before we get there, we have a cool night ahead. Here is a look at the expected low temperatures. Saturday Night... Decreasing clouds. Breezy. Lows in the mid 40s. Sunday... Sunny. Breezy. Highs in the low 70s. Sunday Night... Clear. Lows in the upper 40s. Monday... Sunny. Highs near 80. Monday Night... Mostly clear. Lows in the low 50s. Tuesday... Sunny. Highs in the low 80s. Wednesday... Mostly sunny. Highs in the low to mid 80s. Wednesday Night... Mostly clear. Lows near 60. Thursday...Partly sunny. Showers possible. Highs in the low 80s. Thursday Night... Mostly cloudy. Lows in the low 60s. Friday... Mostly cloudy. Showers possible. Highs in the low 80s. Friday Night... Mostly cloudy. Lows in the low 60s. Saturday... Partly sunny. Afternoon showers possible. Highs near 80. RELATED: Understanding severe weather: What's a Marginal Risk, what's a Slight Risk? STAY ALERT | Download our FREE app now to receive weather alerts. You can find the app on iTunes and Google Play.